Centifolia Natural Rhassoul is a saponiferous earth containing soap to sheath and strengthen the hair fiber. Absorbent and purifying, Rhassoul can be used as a replacement for a traditional shampoo or as a dry shampoo because it absorbs the sebum from the scalp. This powder can also be used for personal hygiene, for an ultra-soft cleansing. 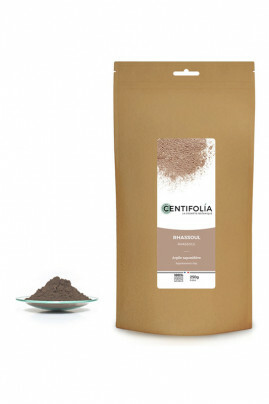 Free from additives, the Centifolia Rhassoul Powder 100% Pure makes your hair softer ! CENTIFOLIA 100% pure Rhassoul absorbs excess sebum without damaging your hair ! Rhassoul can be used as a shampoo replacement or for personal hygiene. Mix Rhassoul with water or floral water to obtain a thick paste. Patient 10 to 20 minutes. This clay can also be used for incorporation in dry or liquid mixtures. It is not recommended to use metal utensils with clays, prefer wood or glass.